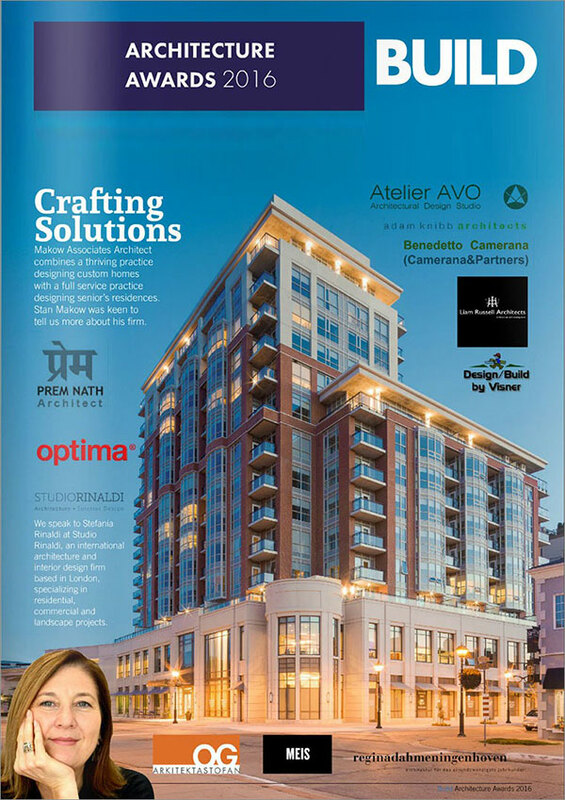 Kitzig Interior Design, has been successfully realizing interior design and architecture projects for 18 years. We spoke to the award winning proprietor Olaf Kitzig to find out more about his unique style. The core competence of Olaf Kitzig and his co-workers’ lies in the area of the Hotel indus-try/Catering trade as well as in the production of tailor-made concepts for the Shop and Retail design. Olaf outlines how the firm has risen to the success it is today. “Our 39-strong team, consisting of interior decorators, architects, designers and graphic artists look after objects in-land and overseas. Our offices develop client’s projects comprehensively. We are your reliable contact partner for interior design and structural engineering. In the area of hotels – notable and well-known names trust in our competence. We create innovative space experiences which unite aesthetic and technology with the modern claims of the guest target group. Clarity and structure, value for money and economic efficiency mark the creative concepts of Kitzig Interior Design. 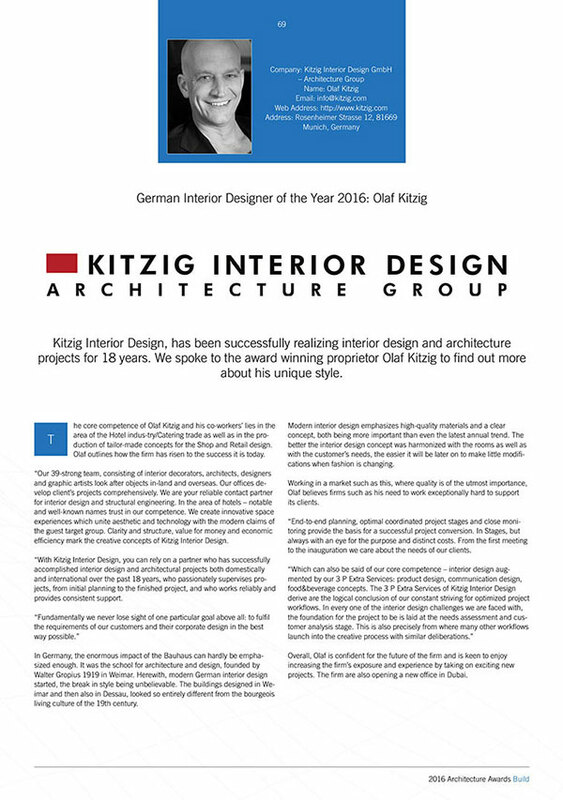 “With Kitzig Interior Design, you can rely on a partner who has successfully accomplished interior design and architectural projects both domestically and international over the past 18 years, who passionately supervises projects, from initial planning to the finished project, and who works reliably and provides consistent support. In Germany, the enormous impact of the Bauhaus can hardly be emphasized enough. It was the school for architecture and design, founded by Walter Gropius 1919 in Weimar. Herewith, modern German interior design started, the break in style being unbelievable. The buildings designed in Weimar and then also in Dessau, looked so entirely different from the bourgeois living culture of the 19th century. Modern interior design emphasizes high-quality materials and a clear concept, both being more important than even the latest annual trend. The better the interior design concept was harmonized with the rooms as well as with the customer’s needs, the easier it will be later on to make little modifications when fashion is changing. Working in a market such as this, where quality is of the utmost importance, Olaf believes firms such as his need to work exceptionally hard to support its clients. “End-to-end planning, optimal coordinated project stages and close monitoring provide the basis for a successful project conversion. In Stages, but always with an eye for the purpose and distinct costs. From the first meeting to the inauguration we care about the needs of our clients. Overall, Olaf is confident for the future of the firm and is keen to enjoy increasing the firm’s exposure and experience by taking on exciting new projects. The firm are also opening a new office in Dubai.